That’s what the sweatshirt said: Shed Happens. It was an appropriate statement, as anyone who has ever worn black pants near my khaki-colored dog can attest. 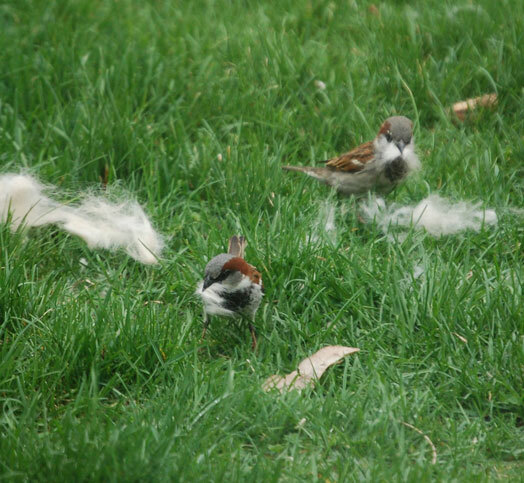 Who knew a shedding dog & nesting sparrows were a match made in heaven? Springtime shed makes sense. Animals are losing their heavy winter coats in preparation for the warmer summer months. But springtime shed does not just benefit the one putting on a sleek new summer coat. God’s design is far more intricate than that. So often we see just one small piece of life’s puzzle. There are so many things we will never understand this side of heaven. But in the intricacies of nature, we sometimes glimpse something deeper. Yes, nature can be harsh. One creature’s loss is another’s gain, and that loss may not be as innocent as a tuft of fur. But in the peaceful symbioses that do occur, we get a glimpse of what Eden might have been. Where all things worked together for good in a way that was immediate, and obvious, and universal. Imagine these simple, mutually beneficial relationships on an even grander scale. 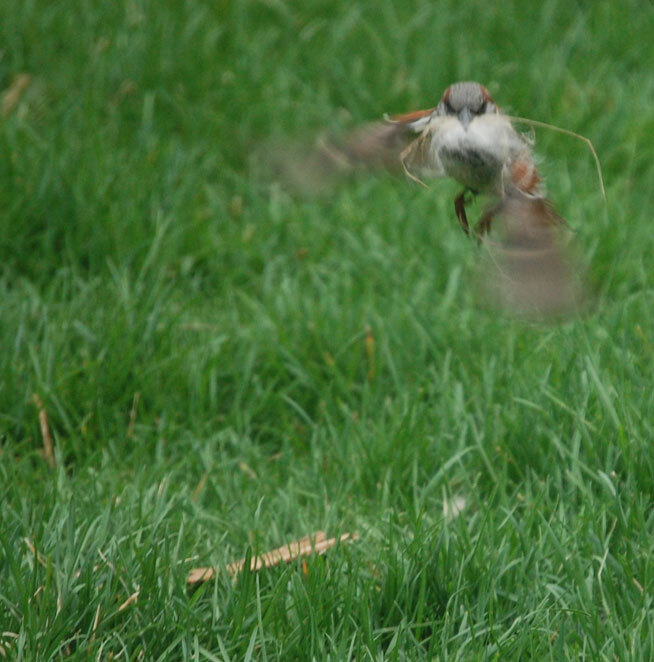 Imagine everything working together as happily as a shedding dog and a nest-building sparrow. Kind of takes your breath away, doesn’t it? Too often the beautiful relationships in this world are overshadowed by relationships of conflict. We live, after all, in a world that struggles with pain and death and spiritual sickness. But if we look closely, we will find that there are still elements of God’s good design all around us. These evidences point us back to a Creator who has not abandoned His beloved creation. God still holds all things together (Colossians 1:17). Even shed happens for a reason. Think about that the next time you’re brushing pet fur off your pants. p.s. – Thanks to my photographer friend for these great shots! The Sunday after Easter is Doubting Thomas Sunday. It’s true across multiple denominations, and it’s true whether you are on a one year lectionary or a three year lectionary. You may have heard Thomas’ story so many times you think you’ve heard it all. On the evening of that day, the first day of the week, the doors being locked where the disciples were for fear of the Jews, Jesus came and stood among them and said to them, “Peace be with you.” When he had said this, he showed them his hands and his side. Then the disciples were glad when they saw the Lord (John 20:19-20). All of the disciples that is, except for Thomas. Now Thomas, one of the Twelve, called the twin, was not with them when Jesus came. So the other disciples told him, “We have seen the Lord.” But he said to them, “Unless I see in his hands the mark of the nails, and place my finger into the mark of the nails, and place my hand into his side, I will never believe” (John 20: 24). Juxtapose this story with one that occurred earlier in Jesus’ ministry. Jesus had just completed several miraculous healings and a second miraculous feeding – this time of 4,000 people with just 7 loaves of bread and a few small fish. But these miracles weren’t enough of a sign. The Pharisees came and began to argue with him, seeking from him a sign from heaven to test him. And he sighed deeply in His spirit and said, “Why does this generation seek a sign? Truly, I say to you, no sign will be given to this generation.” And he left them, got into the boat again, and went to the other side (Mark 8:11-13). Well, then. If that is Jesus’ response to a demand for a sign, what do you think He does with Thomas? Thomas, one of his twelve closest friends who had travelled with Him for three years and personally witnessed countless miracles – what does Jesus do with him? But Jesus doesn’t respond that way, does He? Eight days later, His disciples were inside again, and Thomas was with them. Although the doors were locked, Jesus came and stood among them and said, “Peace be with you.” Then He said to Thomas, “Put your finger here, and see my hands; and put out your hand, and place it in my side. Do not disbelieve, but believe” (John 20:26-27). Here we have two stories, both with people demanding further proof from Jesus, and yet two very different responses from Jesus. What was the difference? The difference, I believe, is that Jesus knew the asker’s heart. Numerous times throughout the New Testament we read how the Pharisees asked Jesus things to test Him, to trap Him, or to ridicule Him. They did not come to Jesus with sincere doubt; they came to Jesus with self-righteousness and hidden agendas. One more sign would not bring them any closer to God. But to those who sincerely asked – for those who wanted to believe but struggled – Jesus had a very different response. Then he said to Thomas, “Put your finger here, and see my hands; and put out your hand, and place it in my side. Do not disbelieve, but believe” (John 20:27). Did Thomas ever doubt again? I don’t know. Based on my own experiences, I would say probably. But based on my own experiences, I would also say that wrestling with those moments of doubt ultimately led him (again and again) to a deeper exclamation of faith. Sometimes in order to be genuine in our faith, we must first be genuine in our doubt. And that, to me, is the lesson from Doubting Thomas Sunday. I have a tragic flaw. Okay, so I have more than one, but this is the one I’m going to tell you about today. I love sports, but sports do not love me. I’ve tried softball, but I tend to duck and cover when the ball comes my way. I’ve tried flag football, but I cannot catch a football to save my life. In middle school, I played basketball. I loved basketball. Sometimes I even did something amazing, like make a basket. But in three years of playing, my team never won a single game. Not one. I was thinking of this a few weeks ago as I was running past the tennis courts. (In case you’re curious, I took tennis lessons for two summers and still can’t hit the ball.) As I jogged past watching the players, I had the audacity to think: maybe running is my sport! Keep in mind that even as I had this thought, I was wheezing and gasping near the back of the pack. Hope does not disappoint, Paul says (Romans 5:5). And here’s the hopeful thing about running. Running is the only sport where every person at the starting line could win. I don’t just mean everyone has the potential to win. I mean everyone can actually win. Simultaneously. I realize only one person crosses the finish line first. And when the summer Olympics roll around there will only be one gold and one silver and one bronze. But the very heart and soul of running is not about besting the other guy; it’s about besting yourself. Running is about stretching, growing, pushing, improving. It’s about hitting that next personal record. Every other sport has a winner and a loser. In other sports, even in the friendliest just-for-fun matches, one team can win only if the other team loses. Perhaps Paul knew what he was doing when he compared faith to running a race. After all, Jesus Christ came so that whoever believes in Him – not just the ones who believe first or strongest or best, but whoever believes! – might not perish but have eternal life (John 3:16). God wants all of us to win the faith race. This does not mean it is easy. Paul even says, Do you not know that in a race all the runners run, but only one receives the prize? So run that you may obtain it (1 Corinthians 9:24). In other words, every one of us should train as though we are going for the gold, even though our true goal is far more valuable than that. Every athlete exercises self-control in all things. They do it to receive a perishable wreath, but we an imperishable (1 Corinthians 9:25). In this race we are running, we all have obstacles to overcome. Each of our races may be different, but the Bible tells us how we are to face them. We are to run with endurance (Hebrews 12:1). We are to run looking to Jesus, the founder and perfecter of our faith (Hebrews 12:2). And just like with my running group, we are to consider how to stir up one another to love and good works, not neglecting to meet together…but encouraging one another… (Hebrews 10:24-25). In this competitive world, it is very easy to fall into the trap of thinking someone else must lose in order for us to win. If we stop to think about it, we will suddenly realize we are actually all on the same team. The route ahead may look hard, but with Jesus as our Coach and God’s Word as our training manual, we can run our race knowing that every one of us will make it across that finish line. High fives all around, my friends. And let’s keep running. I have fought the good fight, I have finished the race, I have kept the faith. Henceforth there is laid up for me the crown of righteousness, which the Lord, the righteous judge, will award to me on that Day, and not only to me, but also to all who have loved his appearing (2 Timothy 4:7-8).